62 - that's the number of years since the British jumps trainers' title went to Ireland when Vincent O'Brien ruled in 1954. Unsurprisingly, our trainers’ title contenders have been busy all week, with Mullins executing a surprise raid on Perth while Nicholls asserted his authority left, right and centre, including with a treble on Thursday. He is currently 8-13 to regain the title, but before landing the Scottish Grand National was out to 5-1. 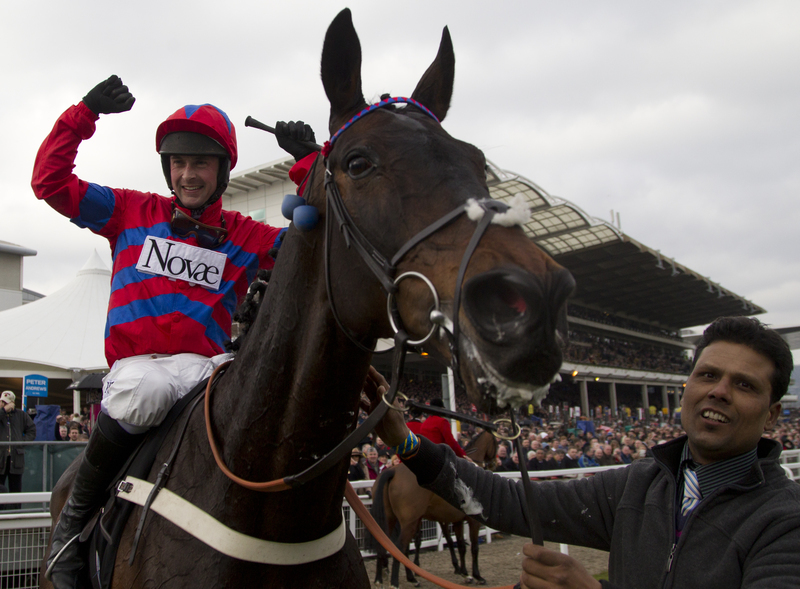 Both have contenders in the bet365 Celebration Chase - Dodging Bullets, Solar Impulse and Ulck Du Lin for Nicholls and Un De Sceaux for Mullins, but I think there are a fair few people who will be rooting for neither, instead hoping for another fairytale chapter in the story of Sprinter Sacre. Once with the world at his feet after an almost unbelievable 19-length victory in the 2013 Champion Chase, racing fans drew a collective breath after Barry Geraghty pulled up Sprinter Sacre on his seasonal reappearance when 2-9 favourite in Kempton’s Desert Orchid Chase. Henderson’s stable star was diagnosed with a fibrillating heart but, after three years of hard work by the Seven Barrows team and vet Dr Celia Marr, he provided one of the highlights of this year’s Cheltenham Festival when regaining the Champion Chase crown under Nico de Boinville. 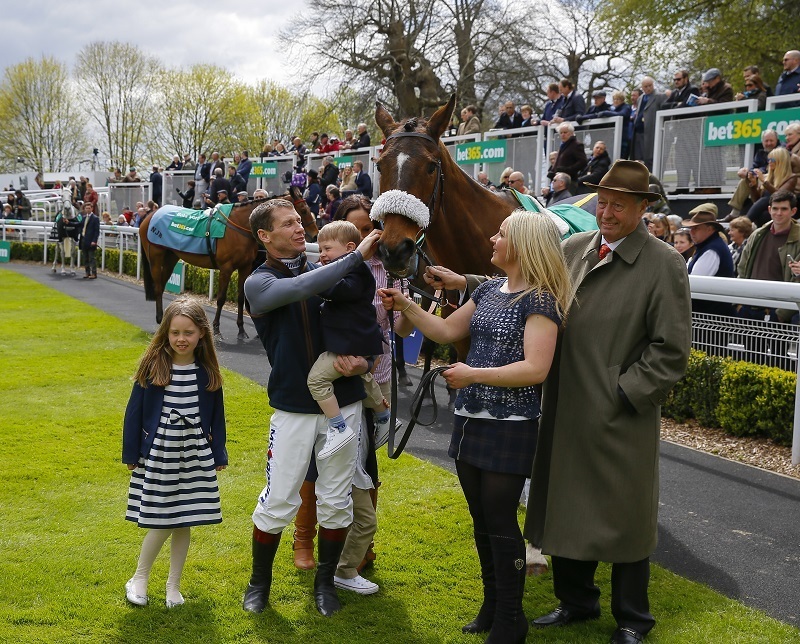 On such a momentous occasion as today, I'm turning to ace wordsmith Lee Mottershead to give us a bit more of an idea of what it all means for Richard Johnson and racing . . .
A year ago we witnessed the man who became Sir Anthony McCoy anointed champion jockey for one last time. Today, we see Richard Johnson anointed champion for the first time. Whereas McCoy’s final coronation inevitably triggered mixed emotions, there is nothing but happiness to be had from seeing the sport’s perennial number two finally, deservedly, joyfully, become number one. By winning the final jumps race McCoy ever rode in, Johnson immediately picked up the baton from his great rival and friend on this very card. From that moment he was the one to beat and he has proceeded to beat them hollow. Quite astonishingly, the 38-year-old – Dickie to his friends, Richard to his family – has ridden more than 100 winners more than any other rider in a season in which some expected a fierce fight between those aspiring to take over from McCoy. That fight did not materialise. Instead, we have known for months that this would be the day Johnson’s lifelong dream comes true, 22 years after he rode his first winner. 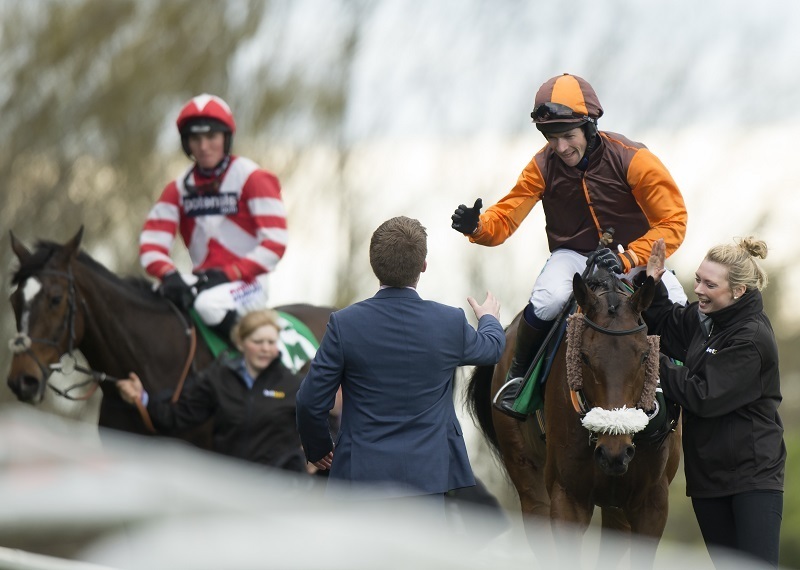 This is the day when we can at long last describe Richard Johnson as champion jockey. Aside from McCoy, no jumps rider has ridden more winners than the man who finished second to him in the title table 16 times. Through all those years Johnson never once begrudged being in the shadow of another and never once said anything other than flattering words about the man who possessed the thing he most desired. That is because Johnson has always been a champion in everything but name. He is as brave and resilient a jockey as we have ever known, an absolute gentleman, unfailingly polite, ever helpful and always a friend to the punter. He is the epitome of what a champion should be. On this very special day, a champion is what he becomes. Let's keep looking through the card, and on to the bet365 Gold Cup Chase (I think I’ll get in trouble for calling it the Whitbread, but you all know what I mean). This promises to be a fantastic renewal - and a key one, with £84,405 to the winner. Twenty runners go to post, including last year’s winner Just A Par for Nicholls, but it’s another Ditcheat charge, Southfield Theatre under Sam Twiston-Davies, who is currently favourite. 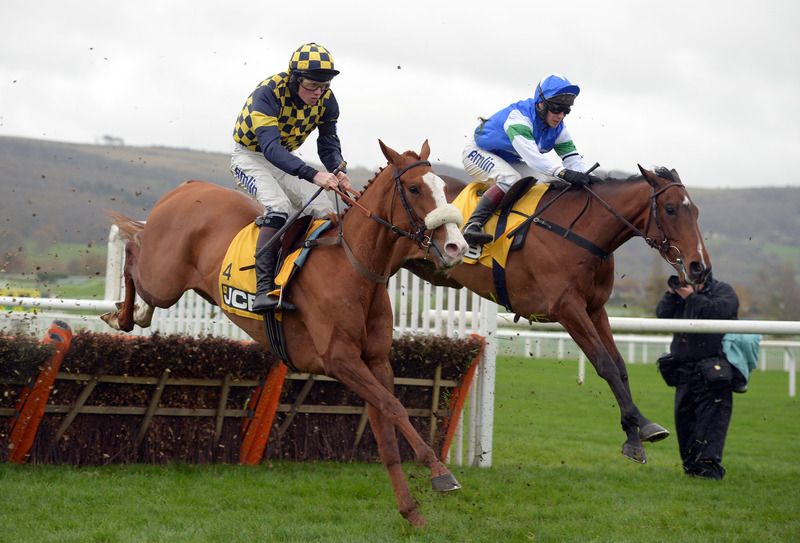 Southfield Theatre has schooled well since [Cheltenham] and takes the eye from a handicapping point of view. After all, this is a horse who finished runner-up to the now 163-rated Don Poli in the RSA Chase last year, yet can race off 150 in a race that should play to his strengths. Since Desert Orchid won the race in 1988, 22 of the 27 winners carried less than 11st - Southfield Theatre is on 11st 3lb. Speaking of the great grey, anyone fancy a little bit of Sandown nostalgia? It’s 28 years since the magnificent Desert Orchid won the Whitbread Gold Cup (it’s okay this time, it was really called that then), making all in a quite spectacular display of jumping that is simply a joy to watch. So go on, have a gander. Aah, those heady days before the arrival of health and safety - oh to have been in the crowd just chilling on the grass between a fence and a bunker as hooves thundered past just metres away. . .
Now when my esteemed colleague Steve Dennis was steering the blog bus at Aintree, he liked to mix in a bit of footie banter. Well, as a Geordie I should have Magpie blood running through my veins (that sounds horrifying, what a terrible analogy), but I’m afraid if you’re looking for soccerball insight, you’ve come to the wrong place . . .
. . . WAIT! No you haven’t, as I just happen to have up my sleeve a tip from Racing Post Sport’s football editor Mark Langdon for today’s action. Richard made me achieve what I achieved, he drove me on and it's great he's getting rewarded today. 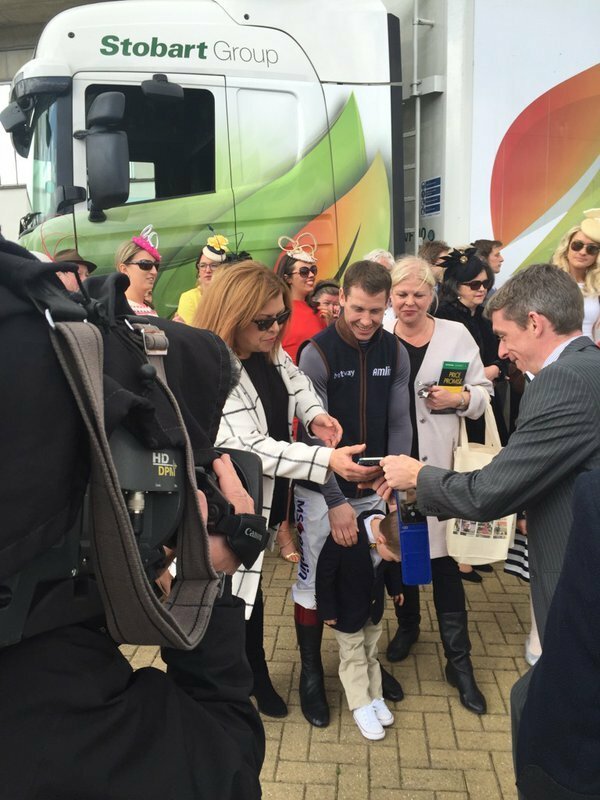 On the Stobart Jockeys' Championship now offering prize-money, McCoy lamented it couldn't be backdated for his 20 year stint at the top. The runners are leaving the paddock for the first of today's seven races. Calculator at the ready . . .
Before the first we were also treated to a parade of champions - here's Johnson reunited with his Gold Cup winner Looks Like Trouble and trainer Noel Chance. Wolf Of Windlesham bounced back to form last time out at Kempton after a disappointing run at Cheltenham on New Year's Day - before that he'd earned trainer Stuart Edmunds his first victory at jumping HQ when landing the Grade 2 Prestbury Juvenile Hurdle at the Open meeting. Little change in the order as the field enters the back straight . . .
Menorah has taken the lead . . . HE'S DONE IT! Menorah wins his third renewal of the Oaksey Chase under Richard Johnson. 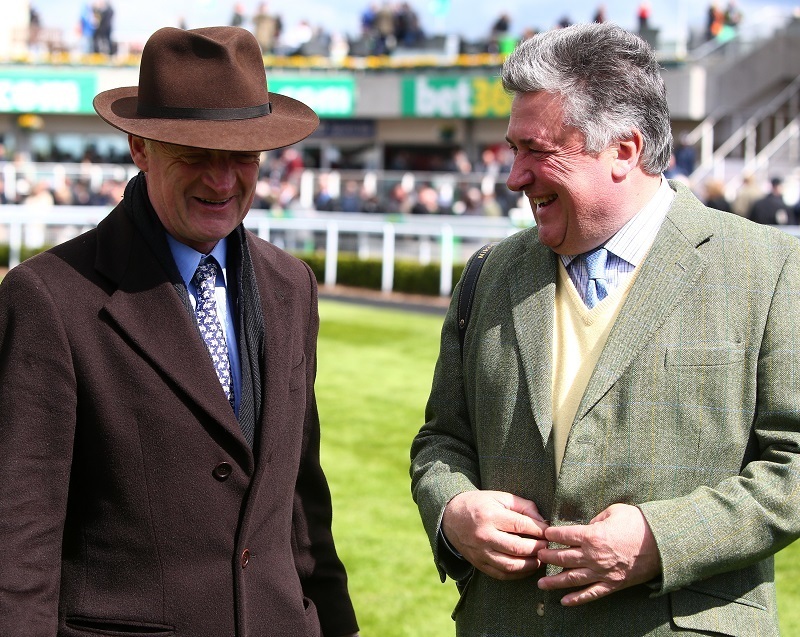 Nicholls has £44,308 in hand over Mullins, with five races to run. The master of Ditcheat remains odds-on to retain his title - but don't forget, we've still got more than £300,000 in prize-money to be won.
. . . but it's all still friendly here at Sandown! Okay, let's re-group, as there's been a lot going on here in Surrey. Paul Nicholls has a lead of £35,995.50 over Willie Mullins - but there's still £260,000 worth of prize-money on offer in the remaining four races. In the next, the bet365 Gold Cup Handicap Chase, Nicholls fields Southfield Theatre - favourite this morning but now displaced by Peter Bowen's Henri Parry Morgan - and last year's winner Just A Par. Mullins is also double-handed with Sir Des Champs and Measureofmydreams, the mount of Bryan Cooper. There's £84,405 to the winner, £31,800 to the second, £15,915 to the third, £7,950 to the fourth, £3,990 to the fifth, £1,995 to the sixth, £990 to the seventh and £510 to the eighth. Paul did, and he's firmly in the Mullins camp - unlike the bookies, who think it's all done and dusted. Paul, he's definitely still in with a shout, it's still all to play for. Theatre Guide making good progress . . . It's going to be close . . . The Young Master wins the bet365 Gold Cup in a photo from last year's winner Just A Par. Unsurprisingly there's plenty of debate on social media about Vroum Vroum Mag being withdrawn at the 11th hour. A number of bookmakers have already confirmed they will be refunding ante-post bets but his decision has upset many punters. Mullins will be heavily fined for the move, but looking at it from his point of view, I think there are plenty who might have done the same - he put up a bold fight, but once the dream faded here at Sandown, he opted to save Vroum Vroum Mag for another target. Some will argue he was right, others will argue he was wrong. Let the debate continue . . . Runners for the bet365 Josh Gifford Novices' Chase are heading to post . . .
She has a couple of options at Punchestown and she was only here for the championship. Mr Ricci kindly let me bring her over here for that to run in a race of much less value. I'm just sorry for people who came to see Vroum Vroum Mag. I'm sorry for punters but I imagine they will get their money back because she was declared. Once the championship was over I think we had to take a different view, plus we learned this morning that Thistlecrack isn't running, which opens up that race. I hadn't even thought about it until we came down off the stand and did the figures. We then said we had better regroup. Asked about a likely fine, he added: "There's no such thing as a free lunch around here." The runners are going to post for the final race of an action-packed afternoon, the bet365 Handicap Hurdle. Willie Mullins has withdrawn Burgas and Paul Nicholls has withdrawn Alcala and Chartbreaker. The Stewards held an enquiry to consider the circumstances under which W P Mullins, the trainer of VROUM VROUM MAG (FR), had withdrawn the mare nine minutes before the race was due to start. They heard evidence from the trainer who stated that, having realised it was no longer mathematically possible for him to win the trainers’ title, he had decided it would be better to run the mare in a more valuable race at Punchestown next week instead. Having heard his evidence, the Stewards found Mullins in breach of Rule (F)96.4.2 in that he had shown a wilful disregard for the interests of racegoers and punters. They fined him £1000. Richard Johnson rides Mad Jack Mytton in the last - can he end his championship season with a winner?